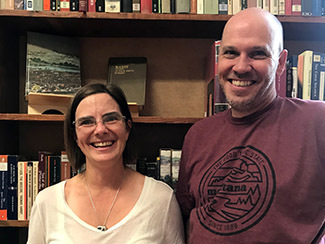 Elk River Books is a collaboration by poet Marc Beaudin and journalist Andrea Peacock, both members of the Antiquarian Booksellers’ Association of America (ABAA). Our goal is to provide a community gathering place for writers and readers, while offering superior quality merchandise, and maintaining the highest ethical standards of our profession. We strive to provide great reads and rare treasures with a wide range of outdoor literature, Western history, arts and Montana authors. We hand pick our regularly rotating stock, so there’s always something new. Our online shop features a curated selection of our finer books. Click the link to browse titles. We regularly host readings and signings by world-renowned and emerging writers. Past authors include Jim Harrison, Terry Tempest Williams, Peter Matthiessen, Gretel Ehrlich, Doug Peacock, Rick Bass and Annick Smith. We also occasionally feature live theatre and music performances. Click the link to see who is coming next. In addition to books, we offer several options to show your love for your favorite independent book store. From T-shirts and stickers to notebooks and event posters, we’ve got you covered. Click the link to see the schwag. Welcome to Elk River Books, an antiquarian and used bookstore in Livingston, Montana. We are proud members of the Antiquarian Booksellers Association of America, the International League of Antiquarian Booksellers, the Rocky Mountain Antiquarian Booksellers Association and the Independent Online Booksellers Association. 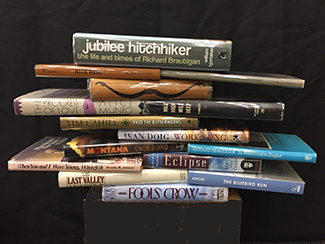 We specialize in rare and collectible outdoor literature, including Native American and western history, adventure and exploration, sporting literature, natural history, works by the Montana Gang, poetry and literary archives. We also carry a curated selection of works by regional authors, children’s books, fiction, books on visual, culinary and literary arts, science, philosophy and more. We stock an affordable selection of writing journals, maps, note cards (many by local artists) and other literary gifts. In the spring of 2014, we teamed up with the Wheatgrass Saloon, so now you can enjoy all-natural juices and smoothies while browsing for your new favorite book. 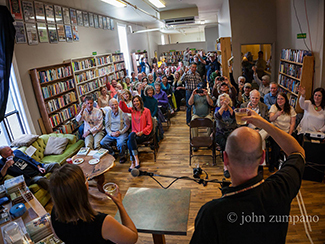 Elk River Books is a center for Livingston literary life, hosting readings, signings, lectures, music and other performance arts. 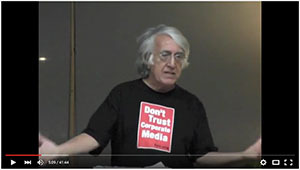 Past authors have included Peter Matthiessen, Terry Tempest Williams, Jim Harrison, Doug Peacock, Carl Hiaasen, Pam Houston and Henry Real Bird, as well as numerous emerging writers. Looking to free up some shelf space? Click here for information on trading or selling your books. 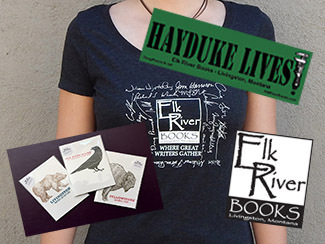 Connecting Audiences with Authors in Livingston, Montana Elk River Arts & Lectures is a non-profit organization dedicated to bringing great writers, artists and lecturers to Livingston, Montana. We seek to provide educational, entertaining and edifying opportunities for the people of southwest Montana in the form of readings, lectures, discussions and workshops presented by national and regional authors and other artists. Click here to learn more.